Here's some neat Easter basket ideas I used one year. It's a bit of a different look than what you might expect, but it's surprisingly simple. I did it on the spur of the moment one Easter, and because I live far from town, I wasn't going to make a special trip to buy coloring, grass filling, etc. 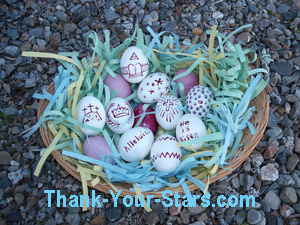 See the photos of an edible coloring dye I used for decorating Easter eggs. I took one of the round or oval food baskets and filled it with light colored paper strips - green, blue, yellow, white, even red. To make the strips, I simply used a long-strip paper shredder. Some of the paper came from office supplies, some came from parts of colored scrap paper that was clean on both sides. Easter eggs are always a great hit among children. 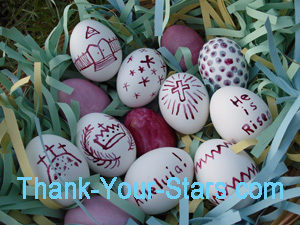 Easter eggs are hard-boiled eggs decorated in different colors and designs to celebrate Easter. 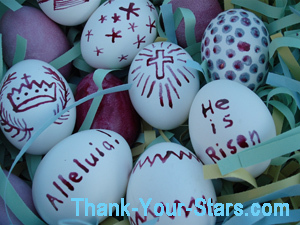 Be sure to tell your children what the Easter Egg means, and why we use decorated eggs at Easter. 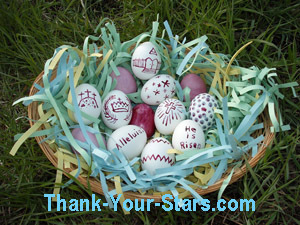 Read about this and more ideas for decorating Easter eggs. Most children like sweets and candy. Us "older children" have to watch our diet, and regulate the amount of sugar we eat. So, we either work or exercise it off, or don't eat much sugar, or we'll pay the price sooner or later. When we were growing up, we would get apples, oranges, bananas, and nuts to crack, especially on Christmas but maybe on Easter too. We didn't get candy. O sure, we craved the sweets other kids in school were getting, but mom and dad were right. They knew what was best for us. We were glad to get these natural treats. They're much healthier anyway. There are some special gifts that are appropriate to include in your Easter basket - some you may not have thought of. Check out some more ideas in unique Easter gifts. Many of them are small enough they can fit nicely into your basket. And, better than eggs and candy, some of them can last a lifetime, if not forever.